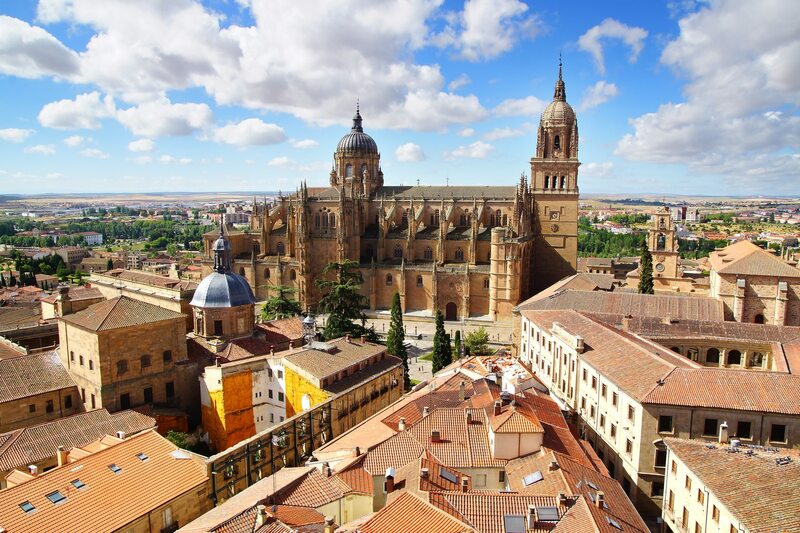 Situated northeast of Madrid, Alcalá de Henares bears great importance to the Spanish language. It is the birthplace of the writer who many consider to be the greatest in history, Miguel de Cervantes, author of “Don Quijote de la Mancha”. 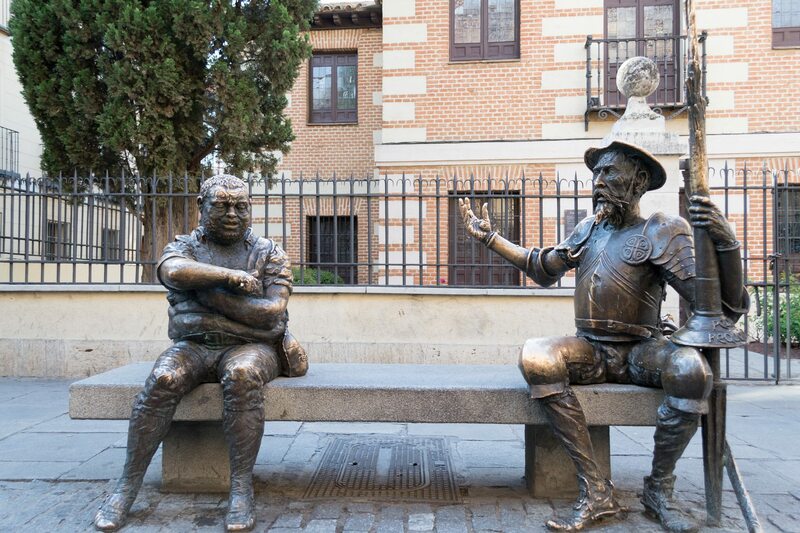 In addition to his cultural value, Cervantes is also very important within the actual city, having the principle plaza named after him. 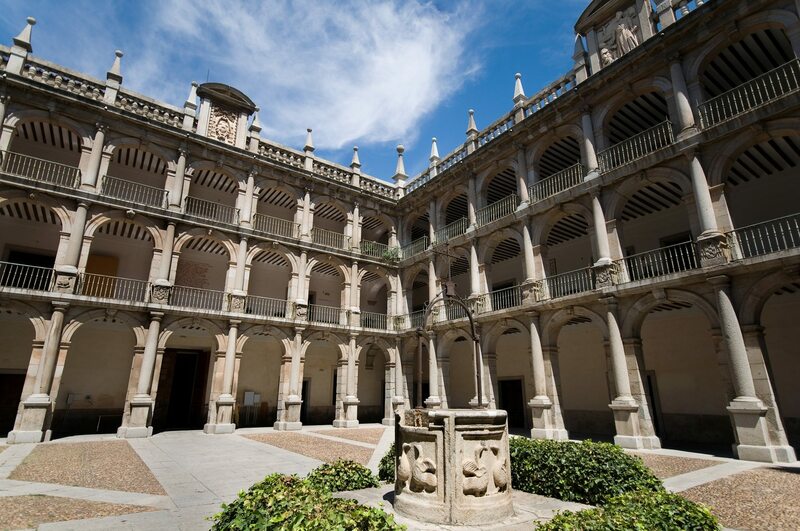 Its university is also quite important, the University of Alcalá, that each year accepts the prestigious award for the Spanish language, the Cervantes Award, in the presence of the Kings. Alcalá de Henares is renowned for its cultural and historic value as a World Heritage Site by UNESCO, embodying the essence of the Spanish language. Guadalajara was birthed in the Celtiberia, taking strong military influence during the age of the caliphate of Cordoba. Its history of consolidation has passed over various stages. 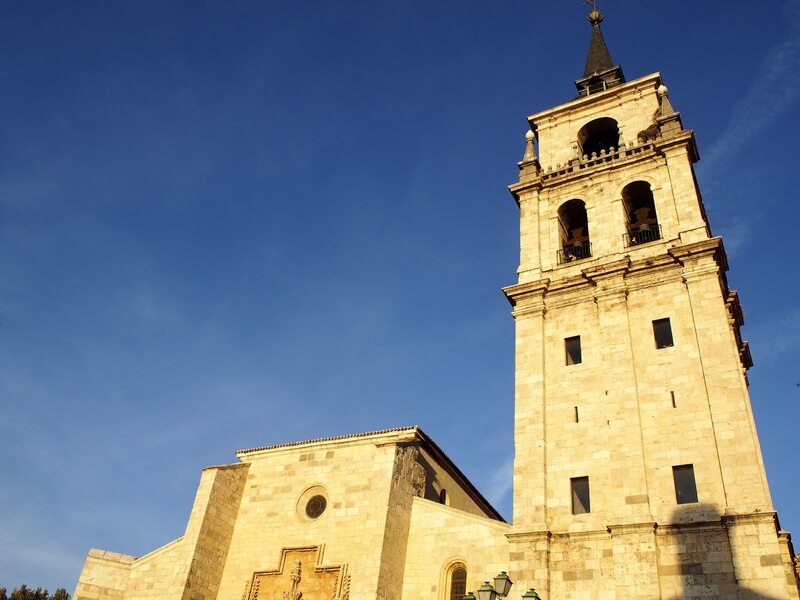 In this city it is highly recommended to visit its city hall, which dates to the beginnings of the 20th century, the church and the crypt of San Francisco or the palace of the countess of the “Vega del Pozo”. Moreover it is recommended to try the most famous product of Guadalajara: drunken sponge cake. Madrid is the capital of Spain and the autonomous community, and has the most amount of habitants. This is the most cosmopolitan city and is home to great activities in all of its areas; from the tourist sites (visiting the “Puesta del Sol” and the Royal Palace) or cultural experiences (the largest theatres, museums, and other shows that are in the city), this city is full of history, culture, and life. 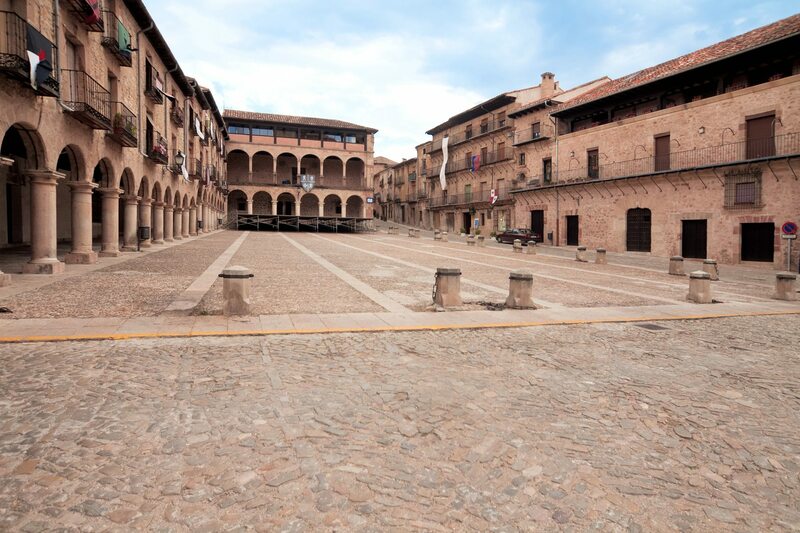 This plaza was constructed in the 13th century, but it was not until the 16th century that it was incorporated into the precinct of the city. It was welcomed during the time with the name "Plaza of the Market", due to the center of commerce in “Alcalá de Henares” and moreover to celebrate the spectacle in its interior. 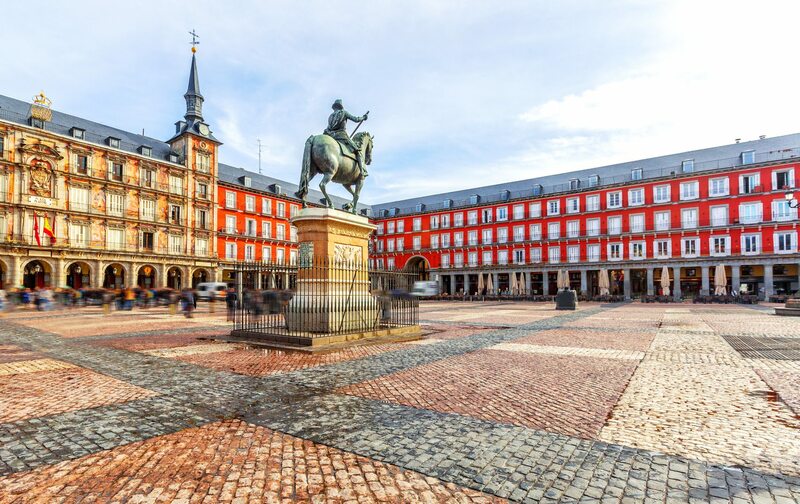 In the 19th century it under went many transformations, including receiving the name “Plaza de Cervantes” Plaza of Cervantes. In its interior, there are various places to visit; particularly the theatre-patio of the comedy, which is a place of spectacle and celebration, as well as the bronze statue of Cervantes. This is a Roman- Spanish school, which name originates from the architect who built it: Hippollytus. In its interior one can still observe ruins of compartments that were supposed to have been a school between the first and third centuries A.C, two pools, and the latrines. The most impressive to visit is the mosaic of the fish, in which a scene of three youths on a ship fishing in the ocean is depicted. This castle is one of the few gaps of the Muslim period in the community of Madrid. It is also called the castle of Abd Al-Salam, because he was the commander and chief of its defense. Moreover, its formation shows characteristics of Spanish-Muslim art. 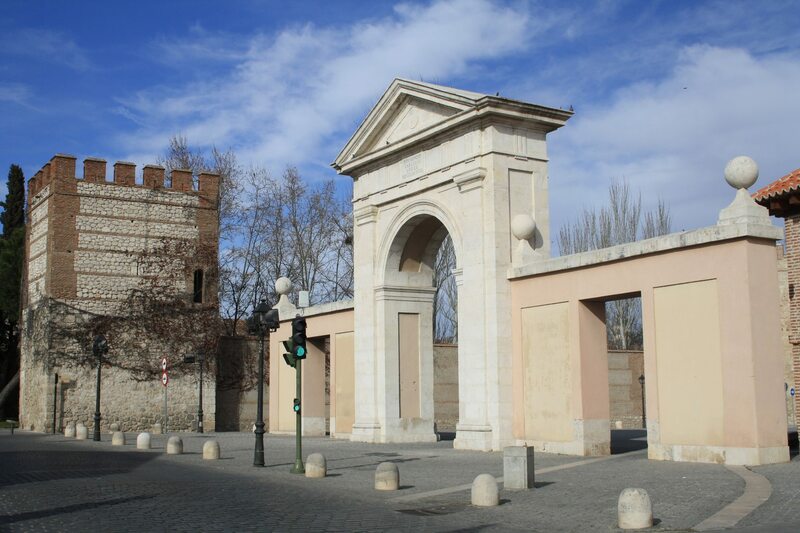 The “Puerta de Madrid” Door of Madrid was constructed in 1772 and can be considered similar to the “Door of Alcala” which is situated in Madrid. The door is of the neoclassical style. Moreover, it has been the setting of one of the most iconic movies in Hollywood: Sparticus (Stanley Kubrick, 1960). It is highly recommended to visit this architectural and cinematographic site. This corral was first opened to the public in 1602 and represents an integral part of Madrid’s culture. Initially, it was made with the objective to celebrate theatrical shows of the same level as the rest of Europe, but after modernization in the sector of pastimes, it was later converted into a movie theatre. However, it was on the point of being demolished in the middle of the 20th century, because of horrible deterioration. Finally, beginning in the ‘80’s, it was reconstructed thanks to institutional participation. Now, it is a perfect place to come and see a play or see its great interior that is structured in various styles including neoclassical and Romantic. This palace was constructed in the 13th century with reforms in the later centuries that have created a combination of various styles. For example, the first interview between the Catholic kings and Christopher Columbus or the place of birth of the younger daughter of the same kings, Catherine of Aragon ( queen of England from 1509-1533). In the interior of the palace contains elements of various architectural styles including mudejar, renaissance, and baroque. The Cathedral of “Alcalá de Henares” is situated on the foundations of various temples, whose first name was, “Santos Niños Justo and Pastor” (employers of the town). Its style is both Gothic and Elizabethan, and the structure is a Latin cross with three vessels inside. This cathedral is one of the only two churches in the world, which has the category of magisterial church. The birth home of Miguel de Cervantes is found, according to experts, in the Alcalá of Henares Main Street, 48. Many go to pay tribute to who is considered by many the best writer in history, because his house has been converted into a museum dedicated to his life and works. Moreover, in order to understand his life and works of literature, there is important bibliographical background in the museum. Also, to have a pleasant visit with the children there are many programs and shows on the days in which the books are celebrated. International day of books and Cervantes Week are two examples of such festivities. 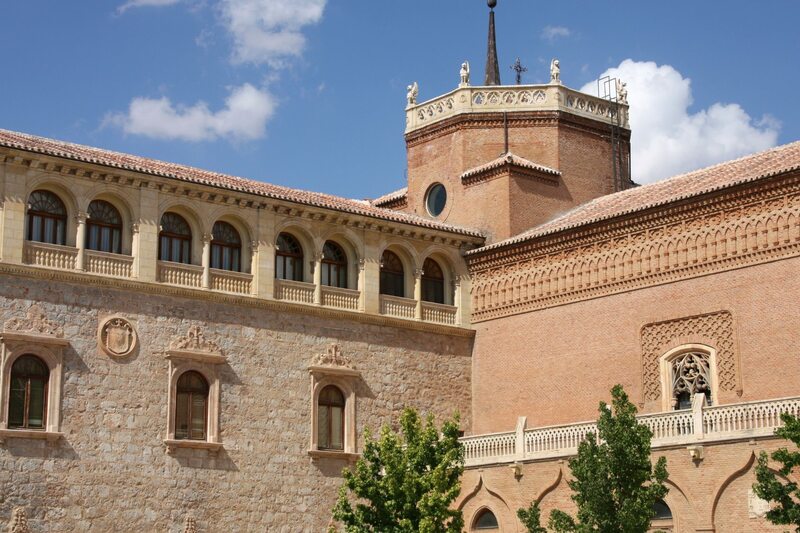 This University is very prestigious throughout both Spain and America, and was opened in 1499 by Cardinal Cisneros. The founder’s goal was to introduce a new model of education, using for reference the models of Paris and Salamanca. On the walls of this historical site are works from Nebrija, Ignacio of Loyola, John of the Cross, Lope of Vega, and Quevedo. This building was declared a UNESCO World Heritage site in 1998. 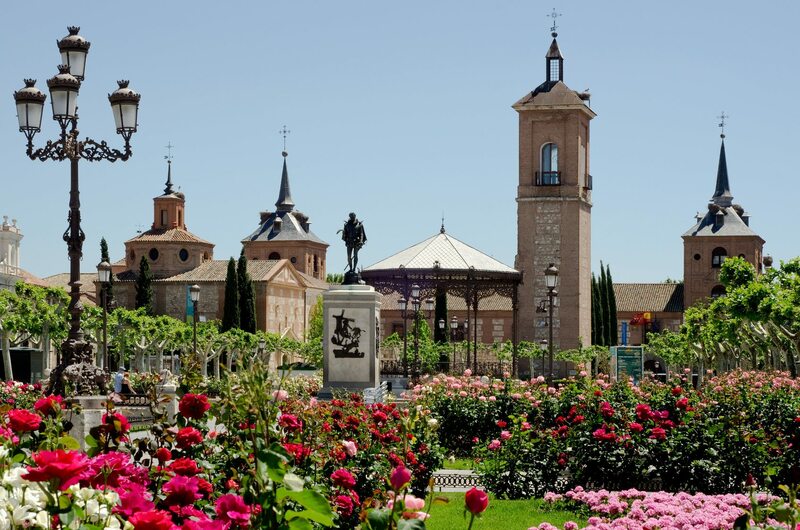 Alcalá de Henares is a city located 30 km northeast of the city of Madrid, which makes it a well-connected destination. There are three available train stations that provide different services. The first is the Central Station, whose train and linked to Madrid, Guadalajara, and other towns. The second is the Apeadero del Campus Universitario, the service mainly used by university students to go to the different academic buildings in the area and lastly, the La Garena station, the last one to be constructed that serves to communicate the outer areas of the city center to Alcalá de Henares. The closest airport to Alcalá de Henares is the Adolfo Suárez Madrid-Bajaras airport that is approximately 25 minutes from the city. It is the largest airport in Spain with flights to different countries, such as Lisbon, Amsterdam, Milan, London, Paris, etc.